6/2012: You'll find a great, mind-blowing overview of how color perception works on Jason Cohen's blog. He points to a far more in-depth source which will also reward your time. 12/2011: Charlie Loyd has written a nice analysis of the techniques presented in this article, and makes a good case for sine-generated rainbows (which he has nicely dubbed the "Sinebow") as an aesthetic improvement over the more common HSB-space rainbows (which have brightness/saturation spokes). 1/2011: Since I wrote this tutorial, CSS3 has introduced the hsla() color specifications, which makes the kinds of tricks explained in this article much easier on browsers that support CSS3. Since my intent was to teach some simple color theory and applied mathematics, I suggest you pretend this feature doesn't exist as you read this article. Then, afterwards, feel free to use it willy nilly! However, the sinebow presented here has some aesthetic improvements over an HSL hue sweep, as you will see. This is a tutorial on how to produce sequences of discrete colors, for use in fonts, graphics or tables, such as in the color strips shown here, or the title of this article. I am going to use javacsript for my code examples, but you can use the same basic techniques in any language, and indeed I originally developed these tricks in C, but I now use the same old tricks in C++, Perl, Processing, Java, Flash Actionscript and other languages. Well, let's get to it, shall we? On computer monitors, you get different colors by combining red, green and blue. The red, green and blue levels are called 'color components'. This represents an RGB color with 8-bits per component. In an 8-bit color system, the values of the color components, R, G, and B can go from 0-255. But the HTML color specification uses hexadecimal notation for each of the components, so that they each occupy two digits. Hexadecimal numbers are base 16 numbers. You can use the following table to convert two digit hex numbers to their decimal equivalents. If you don't have a calculator handy that does hexadecimal -> decimal conversion, it's not too hard to do it yourself. Just take the first digit, convert it to decimal (using the above table, which is easily memorized, especially if you're not busy friday), multiply it by 16, and then add the decimal equivalent of the second digit. For example, the number AB corresponds to 10*16 + 11, or 171. And know that the string '#AABBCC' is in the output value, ready to be output as HTML, using the document.write() command. This function relies on the binary arithmetic operators >> and &, which treat the numbers as binary, which is closely related to hexdecimal. Every 4 bits (or binary digits) in a binary number corresponds to a single hex digit, 0-F. So this function takes the leftmost 4 bits of the number (given by n >> 4, which shifts the number right by 4 bits) and converts it to hex, and then takes the rightmost 4 bits of the number (given by n & 0x0F, which masks off the rightmost 4 bits) and converts it to hex. Sine waves are really useful in real life, contrary to what you might have inadvertantly learned in trig class, and they are especially useful for all kinds of things relating to graphics and music. I personally have π memorized up to 8 digits. Kind of a waste of gray matter, really. I can use the return value of Math.sin() to make fluctuating color values. However, I need to do a little conversion. As shown above, the return value of Math.sin() goes from -1 to 1. The color components I use to make RGB colors go from 0 to 255. So I need to translate a number from the range (-1 --> 1) into (0 --> 255). This isn't too hard because we know that we want the sine value to start at some center value, and then go up and down by some amount. Since the sine wave goes up to 1, and down to -1, it is already normalized (meaning that it's maximum value is 1, a very useful number). We can just multiply it by some other number, and it will go up to that number, and down to the negative version of that number. For our color values, it will work well if we use 255/2 for our center value, and have the sine value go up and down with an amplitude of 255/2 (which will take us to 255 and down to 0. ...which isn't exactly the same, but close enough. center controls the center position of the wave. Now I can modify my original sine wave loop, and produce a series of test colors. Inside the document.write I am producing a color by calling RGB2Color(v,v,v). Since I pass the same value in 3 times, for red, green, and blue, I will get a gray color. In gray colors, red, green, and blue have the same value. To view the color, I print out a block character, using the unicode value &#9608;. For fun, I can try using a series of different values for frequency. This is what I'll get if I add an additional outer loop that changes the value of frequency. However, the results are so close, that I think 2 and 4 are fine substitutes. It is said that ancient Egyptians thought that π was equal to three. And in this tutorial, we're gonna code like an Egyptian. This basic phenomenon - that three 120° out-of-phase sine waves produces a rainbow effect is something I've known about for a long time - since the mid 1980s actually. I originally discovered it just by playing around with using sine waves to make color (a frequent activity which took the place of having a life). Once I learned this trick, I started using it whenever I wanted an assortment of bright colors. For example, the dots in my Whitney Music Box are colored using this system. 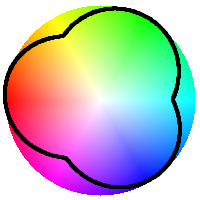 Even though it doesn't make a perfect hue circle, the sine-wave trefoil makes a pretty color gradient, and it's pretty easy to get a rainbow effect in just a few lines of code. I actually prefer it to the "correct" HSB / HSL hue cycle, because it has more consistent brightness. It minimizes the spokes at yellow, cyan and magenta, which you can see in the picture. Now, I'll talk about how to modify the function to produce a greater assortment of colors, and different shades, such as pastels. And here's the code for drawing the basic rainbow gradient. In the changed code, the 230 is the center of the sine wave, and the 25 is the maximum deviation from this center value. So the sine wave starts at 230, goes up to (230+25) and goes down to (230-25). In other words, it has a range of (205-255). Using three different frequencies may produce colors with a low saturation value, such as the black seen in the example above, or grays or whites. This happens when the three sine waves cross the same value simultaneously. If you don't want the colors to repeat exactly, then use frequency values which don't go evenly into 2π. It turns out that the number 2.4 works very well for this. 2.4 in radians, is very close to the golden angle (137.51°), which is the angle that many plants grow new shoots to maximize the sunlight received by leaves. Here I'm using essentially the same technique - I am maximizing the distance between color repeats (which would be like overlapping leaves around a stem). 2.4 is a good frequency to use if you're selecting colors for a pie chart or graph, and you're not sure how many data values you're going to need to plot. Here's the code. If you combine this with the trick of using separate freqencies for each color, and insure that none of the individual frequencies are multiples of each other, you can get even more variety. Here I'm using frequency of 1.666, 2.666, and 4.666. Finally, here's a function that does the rainbow effect on a line of text. Well, that's it. I hope you enjoyed the tutorial! If you have any questions or comments, add them to the blog entry about this article, which you'll find here.